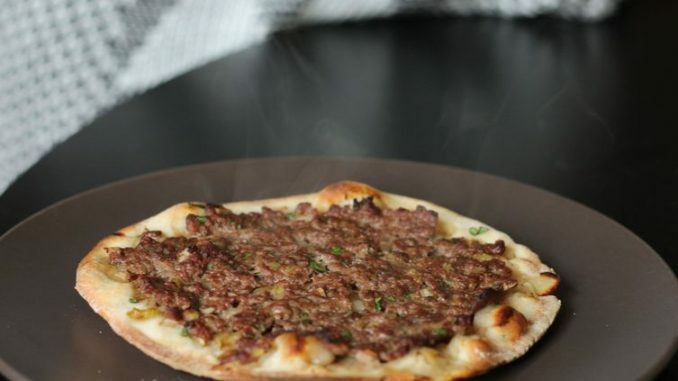 Original & traditional Lebanese Pizza recipe - Lahm bi ajeen. Learn how to make Lahm bi ajeen Pizza, famous Lebanese Appetizer (side dish). 1. Put the flour and the tsp salt into a bowl. Mix the yeast with the recession in the flour.then, add sugar and a little warm water. Knead it to change to a pre-daugh with the adition of flour if necessary. Keep it for 10 minutes after covering. 2. Add 2 tbsp oil and knead the dough well. Then mix it with warm water following instructions.The dough should not be wet and should not stick to the bowl. Roll into a ball and leave in a warm place for 1hr. 3. Mix all dough ingredients and work with your hands Untill you obtain a firm dough . 8inches width OR Roll it to becomes a rounded flat piece with 1 cm as possible and make a border using your fingers. 4. Chop the peeled onions and press the garlic through a garlic press. Wash and finely chop parsley. 5. put oil in a pan and medium heat and cook the minced meat, onions and garlic for about 5 mins stiring all the time.cut the tomato in small pieces, Pepper, salt and mix it together. take away from the heat. 5. Pre-heat oven to 200c. 6. Grease the baking tray, put the mankoushe on it and spread all the sauce type mixture over each pizza and cook in the middle of the oven for 10-15mins. Wait till the bread becomes golden brown.